STARION CONQUEST REAR STRUT PROBLEM SOLVED. As most of you know there are no Rear Struts available for the Starion or Conquest at this time. As always, in our effort to keep these cars on the road we have come up with a solution that converts your Stock Sealed Rear Struts to Tokico Replaceable strut inserts. At this time we are doing the conversion on YOUR Stock rear Struts. This requires Cutting, machine work and welding so we are not selling the pieces as a Do-It-Yourself package. What you will get: 2 Modified Housings with KYB Rear Struts installed and be replaced in the Future and Modifed upper strut mounts. Ready to bolt In. Add $139 for 2 new Rear Upper Strut Mounts if yours are Damaged or worn out. 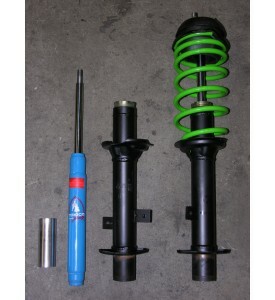 Stock Spring Perches and allows you to Raise or lower each corner of the car.